She's the mother of Gary McKinnon - a British computer hacker accused of perpetrating the largest military hack of all time. Janis Sharp has been leading the fight for her son to remain in the UK. Although not yet found guilty, McKinnon has been at the center of an international extradition case that has lasted nearly four years - his mother Janis Sharp has been alongside him every step of the way. McKinnon was first accused of hacking into a number of U.S. military sites including the Department of Defence, the U.S. Army and NASA in 2001 and 2002. Authorities claimed that McKinnon deleted important files and accessed classified information and subsequently his actions shut down numerous computer networks as well as costing the government nearly a million dollars to fix the problem. McKinnon has admitted breaking into computers at NASA and the Pentagon. While McKinnon is currently in the UK, the U.S. government has been trying for several years to have him extradited. After legal hearings in 2006, the UK agreed to extradite McKinnon, but his lawyers appealed the decision and the case is still being heard. One of the key reasons lawyers are fighting McKinnon's extradition is because the 44-year-old has been diagnosed with Asperger syndrome. People with Asperger syndrome suffer difficulty in social relationships, communication, and social imagination, according to The National Autistic Society in Britain. Asperger syndrome may often include having special interests and becoming anxious if a routine is broken. McKinnon's mother, Janis Sharp has been leading a massive campaign to fight calls for her son's extradition. There's a Facebook group with over 700,000 members opposed to McKinnon's extradition. David Gilmour from Pink Floyd, along with Bob Geldof and Chrissie Hynde have also produced a song called "Chicago - Change the World" in support of McKinnon. Here's your chance to ask the mother of Gary McKinnon a question. Please post your questions below and remember to include where you're writing from. –	What is your opinion on our International Justice System? – What advice would you give many families with autism worldwide, who are living below the poverty line? I am awaiting Janis Sharp’s replies. I would like to know whether any US military personnel have been prosecuted or disciplined for failing to ensure the security of their computer systems, since I understand there is a legal obligation on the US military to do so. Surely those responsible for the breach in security should be held to account, especially since by doing so, they committed a serious federal offence? Is it true that there were hundreds of people from around the world, including Turkey and China, who were on the US computer systems at the same time as Gary? Has the security of the machines in question been improved, since 2002? Or are people around the world still accessing US military computers? 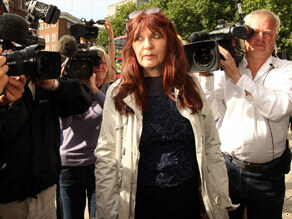 Firstly can I say congratulations to Janis Sharp for her ongoing courage in fighting for her son Gary McKInnon. With a huge amount of support on the social networking sites like Twitter and Facebook. My main question has to be this: With an election coming up in the UK and considering the Labour Party have given no help to a British Citizen like Gary, we hear that Nick Clegg leader of the Liberal Democrats supports Garys case and would not allow his extradition if elected. The Conservative Party Conference also said the US/UK Extradtiton Treaty as unjust. Do you think the electorate should know their parties position on this before the election ?? It would be great if Janis could tell the audience – How has the whole case 'affected' your life and that of your nearest and dearest? (1) Can Janis tell us whether any US citizens have been extradited to the UK under this reciprocal arrangement? Or to any other jurisdiction in similar arrangements? (2) How many UK citizens have been extradited (or threatened) in this way? I'm aware of the NatWest 3, and Ian Norris of Matrix Crucible, all accused of white collar "crimes" which would not be prosecutable in the UK. Are there others? (3) I've read that Gary's hacking consisted of breaking into Windows machines for which admin passwords had not been set i.e. they were left at factory default "Password". Is that true? If so, why isn't anyone prosecuting the US military and Microsoft!! Hello Janis I admire the way you have fought for your son Gary. Can you tell me how do you feel about the way the UK government is treating UK citizens in regard to the UK/US Extradition Treaty and how this this impacting on Garys case. Do you have any confidence in the Labour government and Alan Johnson in particular in regard to protecting the interests of british citizens especially after the fate of Akmal Shaikh in China. I wish you and your son every success with your freegary campaign. I have read on internet that there isnt any evidence that Gary McKinnon caused a single cent of damage to those computers, and so it is wrong that he should be extradited because what he did was not so serious. Lots of media and politicians say that Gary did a terrible crime and caused $700,000 damage and he admits it, so he should be extradited. What is so special about Gary's condition that should preclude his extradition to the USA? I don't get the problem...he did something that he should not have and should pay the price no? If you had the opportunity, what would you say to President Obama regarding this horrendous situation ? btw we are all so very proud of you, Janis. I don't think anyone's saying his condition should preclude paying the price, as you put it. But it does mean that extradition is a more serious and damaging prospect for Gary McKinnon than for someone without Asperger's. So extradition should be weighed very carefully against the seriousness of the crime. If I've understood it correctly, the crime in question was not an extraditable offence, so extradition should not be permitted anyway, Asperger's or not. I'd like to ask you... If the govt say that your son Gary caused around $700,000 worth of damage, have they listed how they came to that figure? It seems strange to me that Gary was just sitting at home on his computer (obviously due to his Aspergers he was very obsessive & extremely clever in his behaviour on it) & from the sounds of it he didn't have to try very hard to access the US military computer systems being as their was no real security!!! 1: McKinnon does not have Asperger's, He's a loser that fried his mind on drugs. 2: 99% of people diagnosed with Asperger's are people with an IQ between 75 and 90. Asperger's is just a "nicer" diagnosis. Because of this, millions are spent on creating a watered-out junior and high school system for these students instead of giving them jobs such as simple maintenance tasks, cleaning and gardening. 4: You get students with an IQ of 80 struggling with succeding in high school and with parents who want them to go to college/university. I am disgusted with this unsupported matter concenring your Son Gary. If we citizens of this great United kingdom were to click our finger's, and ask the U.S.A to extradite one of it's citizen's based upon someone who accidentally accessed a database that was not fully password or security protected, what do you think there answer would be? (because he was looking for information on UFO's (what do you think there response would be. How familiar are you with U.S Constitutional law? Are you aware the U.S Constitution as it was written by it's forefather's was written for all people. With this in mind it is very clear under U.S law the U.S. (Government) are in violation of both your son's Constitutional, and civil rights. You Son Gary is being used in a political PING PONG game, and I know of first hand what he will be subjected to if extradited to any U.S. federal holding centre, or prison. As a person with Family members with Autism and with my own Health concerns with Narcolepsy and Temporal Lobe Epilepsy one can attest that despite her son's diagnoses he should be held accountable. Don't most people with Asperger syndrome consider themselves unique but yet fully capable? Isn't in a fact that Friends, Family Members and Persons with Asperger syndrome themselves fighting so as not to include themselves with other Autistics in the new DSM being written for the very reason that they consider they're disorder a challenge not a fully blown problem that needs correction. Simply put people with Asperger syndrome can not have it both ways either its a disorder that needs help and some compassion or its a unique disorder where will there are certain quarks that make them distinct from the rest. Remember Ms. Sharp your don't have a right to speak for a group for the mistake of your son!!!!!!!!!!! 1. How has Gary coped with the long drawn out series of legal hurdles you have all endured over the years? 2. My son was ‘officially’ diagnosed with Aspergers when he was about 9. It was more to aid his school than anything else. I realised he had Aspergers from when he was about two and an official label had been irrelevant. Do you think you and Gary’s position would be different now if he had the ‘official diagnosis’ in place at the time of his arrest? 3. Is it true that at the last court hearing, CPS disclosure said they had no evidence of any damage whatsoever? You know, if you access a computer system that is not yours, no matter if a password was configured or not, your breaking into someone elses system. Just as if I don't lock the door to my house, you don't have a right to enter it without my consent. Leaving your system open or your door unlocked doesn't mean your smart but it does not give another person the right to enter into it....seems pretty plain and simple to me. Obviously, aspergers or not, this person was smart enough to get himself to "the door" and let himself in. Not cool! However, I'd leave him in a UK criminal justice system, US taxpayers don't need another loser to be paying for...keep 'em, he's yours. Put him on a plane. I really don't understand what point is being proven here. With all due respect, and I do have great compassion for people with Autism and Asperger's Syndrome, but the fact is, Gary committed a crime and should be held accountable just like anyone else that committed a crime. As a boy I was taught to respect the private property of others, and to keep my fingers to myself, no matter how tempting and lovely the target. It is a lesson I also teach my children, therefore I simply cannot understand the logic of preventing Gary from facing the consequences of his actions, especially if we're now being told that handicap citizens should be treated like everyone else. As some people say, if you can't do the time, then don't do the crime! As for the constitutionality of Gary's actions, I believe this is up to the relevant criminal court to decide, not the extraditing authorities. The US government should pay him for discovering the security flaws in their system. Private companies all over the world pay top dollar for that type of service. Better he found the flaws then terrorists who could have made a lot more damage than he did. I don't think Asperger's Syndrome is what this should be about. It's about the absolute injustice of this heavy-handed, one-sided, one-way law that allows the US to demand that a British citizen be sacrificed to save face for the complete and utter ineptness of the US military. This one-way extradition law is a left-over from the arrogance and hubris of the Blair government and its excruciating sycophancy towards the then Bush neocon administration and all things American. Events over the past decade do not install confidence in the US justice system or its respect for international standards of law and order. Guantanamo, waterboarding, Abu Graib, Extraordinary Rendition. It isn't clear that he will get a fair trial. The absurd claim his hacking caused $7,000 shows what they're lining up for him. I'm very angry about this. This will be the first time that I won't mind unduly if the Conservative party wins the UK general election, assuming they will honour their pledge to repeal this act. I'd like to ask Janis Sharp how can we help? Are you in receipt of legal aid? If not how are you paying for the lawyers? Is their a fund? A petition? Those people who say "if you can't do the time don't do the crime" seem to be missing the point. I don't think anyone is saying he shouldn't do the time. The question here is surely what about if you didn't do the crime? Nothing Gary did was extraditable, so there are no lawful grounds for extradition. If not committing an extraditable offence is no protection from extradition, then surely both the US and UK legal systems are not fit for purpose. I can't believe so many people have had the wool pulled over their eyes about this. Let him take responsibility for what he did, sure, but fitting up a disabled man and extraditing on false charges? That's just immoral. Gary has done the US a great service, by exposing some of their system's weaknesses. Let us hope they have learnt – Al-Quaeda and Organized Crime have some of the same skills. Gary should be given a medal, not hounded like this. First, I would like to thank CNN for discussing this case. I am in the US and worked in the Defense/aerospace industry for over a decade. One major question that the US must answer – Where were the security protocol and security staff that allowed any mainframes or systems to sit wide open without their passwords addressed and reviewed ? That is a serious breach of security. CNN – your article failed to address the key element that Gary McKinnon was not seeking nuclear weapons codes or troop movements – he was looking for UFO files. Here we have a young man in the UK who remarkably was able to simply waltz into Army and Pentagon and NASA files looking for proof of UFO's and he becomes a cause for the US Justice system to spend millions trying to render him and what send him to – where GITMO ?? Why ? to justify some huge expenditure for a new security fix or contract – which should have been already covered by routine security protocols ?? Or is the exaggeration of this breach been intended to further distract from the real breaches that go on every day and never make the paper or the courts? The US Justice system should have to reveal what they have spent on this circus and identify the Pentagon/NASA and Army brass and officials at fault for the breach and move on to deal with real issues and threats and malfeasance. I am sure enough contracts and profits have already been made on this high profile show case – ostensibly issued to fix what is a simple case of US security malfeasance and incompetence. McDonnell Douglas Astronautics Division ..
With all due respect to the hater's of Gary Mckinnon, do you believe our court system in the Uk is passing the buck to the U.S.
Do you believe If Gary has committed any crime he has the right to be tried in the country where he committed the crime, and will this end all speculation of his guilt or innocence. Do you have any evidence of how the U.S carry out there judical process's with regards to the rights of British citizens. Do you believe the U.S are bullies? and can you let the record reflect, I am one British citizen who out to prove the U.S. Government bring malicious prosecutions against Uk Citizens. With this in mind do you believe the Uk government do not investigate these claims when made by a British citizen. Are you aware what you would be told by the Uk government if you sought there assistance when you have been legally wronged by the U.S. Government. Do you believe the UK government would intervene in your matter if they knew you were being targeted by the U.S government? Finally, can you tell me in your view, what is the purpose or reasons of sending Gary to the U.S. for his trial instead of trying him here in the Uk. Why can't the matter be settled here in the Uk? What was breaking into the computers at the Naval Weapons Station Earle, two weeks after 9-11 and trashing the system, to do with searching for UFO's? Why are you claiming 700,000 supporters on the Facebook group? This group was previously a campaign against Facebook claiming copyright on members' photos – it was then hi-jacked by your son's supporters and renamed – co-opting the 700,000 members to his cause. Why is the UK *not* supporting a developmentally disabled(what aspergers is classified here in the US) citizen of the United Kingdom? And we here in the US do NOT think Gary McKinnon should be extradited! To me, and no offence to Gary...its like sending a child into court to be harassed,scared to death over something in Garys mind is/was INNOCENT? People with autism,aspergers don't have very good impulse control,if at all...its like "see candy,want candy,got candy" without thoughts of any consequences of taking candy....they just do NOT think like most people do. They become obsessive in their thoughts and don't mean any harm, they just have an insatiable thirst/hunger for knowledge and more knowledge! It's why another name for aspergers syndrome is "little professor syndrome"! The US should do the RIGHT thing and STOP all extradition requests/demands of Gary McKinnon and worry about REAL hardened criminals! I feel ashamed my country is doing this and that the UK is being drug around by the tail by the US knowingly,like in school, tryin to be the US's BFF! Come on! Have common sense AND decency!! DO THE RIGHT THING FOLKS! I ahve tried and tried to contact Mrs. Sharpe,unsuccessfully due to not knowing a contact email address. I know that I can help in her fight for her son. I was extradited in 2007,spent 10 months in jail,awaiting trial and beat the U.S. government and court system.I was found not guilty,having faced 5-99 years in prisonfor a crime I ddi not commit and am now back in the U.K. I should desperately like her to contatc me.I have signed all petitions etc for her son. Audrey Phillips.Birkenhead,Merseyside,U.K. Why is providing British health care and justice for Gary McKinnon such a bad idea? This was a non-violent crime. Why can't there be a non-violent solution. How can anyone argue that Gary's crimes took place in the USA, when the US courts themselves have ruled (in the case of online gambling) that computer crime takes place at the keyboard where it was carried out, not the location where it was effected? By the courts' own admission, Gary should be tried in the UK, surely? Have the prosecutors really considered the legal precedent on this, and don't they open themselves up to a lawsuit by disregarding it with such a flawed prosecution against Gary? Is the Obama administration aware of the damage that pursuing this unnecessary, unwarranted and heavy-handed extradition request is doing to the international reputation of the US? Any questions I had look as if they have been covered so I just wanted to wish you luck and that we get decent answers to the questions that have been raised. Good luck to both you and Gary!! It could have been my own grandson who is autistic. I would fight tooth and nail to see that no harm came to him. And that is exactly what is going to happen if he is extradited. Locking him up to where he is either in lock up or with a group of other people who could cause him harm. You just don't know about asperger's syndrome until you have had a relative live with it or someone's friend who has it. And now the chances of getting it is 1 in 120. Let him stay in the UK. I realize the US is embarrassed that he was able to get into their files but he probably wasn't trying to get secrets, but aliens. I would like to know why you feel that Asperger's is an excuse for him to get away with what he did? You shouldn't hide behind a diagnosis. Giving it this type of international attention gives the world a bad view of Asperger's and autism. My son is autistic, and when he does something wrong, he is still responsible for his actions. This man caused damage and committed crimes against the United States. Saying he shouldn't be punished is wrong. He knows what he did and he isn't a child. I personally hope he gets whatever punishment a "typical" person would get. I'm quite sure, if it was *your* son, you'd feel just as Janis does? But since you're not in their "shoes", it's easy to say what you're saying? Do you know what empathy means? My son is also autistic, he's 17 and I could see him doing something similar to Gary and worry about something happening. It's why I've told him over and over and taught him rules and morals to the very best of my ability, just as I'm sure you have with your son and Janis did with Gary...should they face consequences for actions? Yes! But to be facing 60 YEARS?! In a foreign country, away from your family and ALL life you've ever known? And you did NOT commit a violent or truly hurtful act? Child molesters/rapists/murderers get MUCH LESS in the US! Speaking of....your son...lets say he does something similar to Gary....youd still be saying throw *your* son in prison for 60 YEARS and in with rapists/murderers etc?! Please look up the definition of "empathy" and if afterwards you still feel the same, I feel very sorry for you and especially your son..that you would *want* him to be tried and convicted before he'd even made it to court and thrown in prison for LIFE and throw away the key! :( shame....oh and by the way....theres a REASON your son, my son and Gary and others have autism/aspergers as a diagnosis! Because it is a condition/syndrome/disease that makes them DIFFERENT(in thoughts and actions) than "average/normal" people! It's NOT "hiding" behind it, it's just FACT! Why do you even bother saying *your* son has autism if it means nothing?! And Gary caused NO damage! And hurt NO one! The ones who DID are the ones who work for the US govt who did NOT do their jobs in securing those computers! Also, I'm an AMERICAN and FULLY support Gary and Janis! I'm also a big believer in the universe teaching us lessons....kinda like "kids will always make a lair out of you"?....people who are being so judgemental and harsh, especially ones with autistic children, are bringing on a future scenario similar to this, with their own kids...one day down the road, your child may get into trouble and you'll be fighting to help him, and hurting for him like Janis and you'll remember *your* words and harsh stance against Gary 😦 hope it doesn't happen but the universe tends to remind us later on to teach us empathy! made a BIG oops, sorry!...my last comment was to "Melinda G." not Melissa! Sorry bout that! Melinda – nobody's saying that Asperger's is an excuse. It is, however a mitigating factor, and clearly a far better explanation for his actions than any sort of terrorist intent as prosecutors have claimed. On top of which, it has been pretty much proved that Gary McKinnon didn't cause an ounce of damage. If it would be wrong to extradite a "typical" person on groundless allegations, it is surely doubly wrong to extradite someone for whom such a thing would be doubly damaging, no? If a "typical" person can call for justice – ie a punishment that fits the crime, is supported by the evidence, and is not a violation of his human rights – then why is it wrong for an autistic person to do the same? What gives the world a bad view of Asperger's and autism is the US prosecutors making false allegations about what Gary McKinnon actually did. Aspergers is not an excuse but it is a mitigation. Gary McKinnon did not cause any damage he merely looked around (for ufo stuff as it happens) this was not extraditable. The US authorities claimed damage to make it extraditable. Had they tried to extradite at the time they would have had to prove the damage in a UK court which they could not do, so they waited till the extradition treaty was used where they do not need to provide any evidence at all to extradite a British citizen. He should have the right to a trial before being ripped from his home, family, medical support and banged up in jail waiting for a US trial ( if it ever came ). I just want to ask why even bother hacking into NASA & Pentagon sites? What was the purpose? Why hack into ANY website, especially those government related? Isn't that asking for trouble? Have a great day/week, all! I don't envy your head Janis! What does Gary do without computers? Has he done more that I can get hold of – I have got everything I can find on youtube! I loved that little bit of piano playing at the end of the Chrissie Hynde interview – it was beautiful – which is his favorite intrument? When he was young and stargazing was he also singing? Was he a happy buzzy bit hard work child? Did he ever like taking things apart and putting it together? did he always end up with enough bits left over to build something else? Did the 'thing' he was reparing work? Am I right in thinking he has a wicked sense of humour – when he isn't being mashed by the the second largest economy in the world? What is your last creative output media wise that you feel proud of? If this whole problem went away now (if only).... how big a party would you have.... and could I come please? Gary is a great guy, i wish u good luck. "I am SOLO... I will continue to disrupt at the highest level"
Innocent till proven guilty .You are judging him guilty without any knowledge of the facts. It was proven in the high court that there was not a shred of evidence to support the claim of damage. The disclosure from the CPS at the last hearing showed that the CPS dismissed the evidence as hearsay and/or inadmissable. The message Gary left has been edited both by the prosecution and the Home Office. If you read the full text you'd see it was very pro American people, he was concerned that the American people were losing their democracy slowly but surely and was trying to help them. Quoting selective lines is lying by omission. He observed that the security standown on 911 (which allowed that obscene disaster to happen) was a deliberate inside job and suggested asking those high up in the airforce who is responsible for the Washington district. More than 700 architects and 300 military and law enforcement people all agree with him. Kean and Hamilton the chairman and vice chairman of the 911 commission themselves state that the commission was set up to fail and that they were lied to. And finally it was not two weeks after but much later. Janis i admire your courage, not all women would stand by their son's side. Gary Mcklnnon the U.k govt is meant to pay you for discovering the lapses in their security system, infact if i have my way i would like to talk to Gary one on one bcos i dnt want anything to happen to him. Socrates, love, get your facts straight, and stop talking nonsense. He didn't trash anything. It's a matter of public record. As for that message – it is edited out of context so severely as to totally alter the meaning of what was actually said. Seriously. Check your source. Or better still, go peddle your malice and your false allegations somewhere else.